Step in; watch out for the high threshold and low doorframe though. Welcome to the croft of the Flink, two hundred years back in time. Screw up your eyes, soon they will get used to the dark. We have got a window too, quite small though. And a candle lights up the room nicely. Why don’t you take a seat on the bench and have a look around? It is just a little smoke hut with a lot of stuff on the walls and shelves, nothing unnecessary, all original tools. That’s where we boil the potatoes on the hob and bread is dried up there on the rafters. Pankko is a great place for a little nap. Did you see our smoke sauna and sheds in the yard on your way in? They are as original as this croft. Each shed tells its own story about the life and skills of the peasants. In the good old days nothing was done without reason, everything had its meaning and its place. Yes, yes, if the guests are not in rush we will heat up the smoke sauna. And you will get a nice cup of coffee too in the stable hall. Please stay and have a look around. This is how life was in the past. Hevossilta used to belong to the Forssa Estate, and the land still has buildings standing on it from this time. The museum estate is a combination off two different time periods; the 19th and 16th centuries. The museum yard’s main historical piece is the 200-year-old Flinks croft, which has been transferred to Hevossilta from Nummi of Forssa. 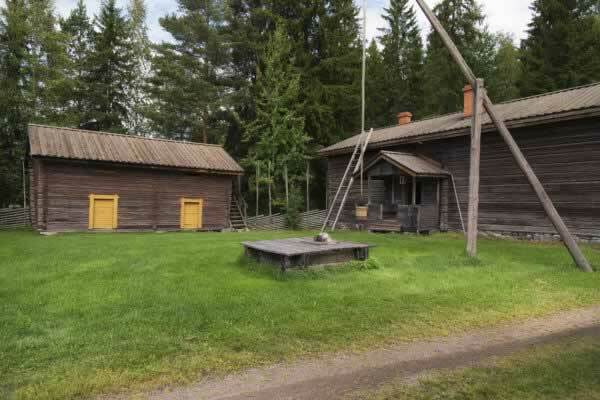 The croft of the Flink is thought to be the oldest complete building in Forssa. The oldest part of the building is dated from 1805. The Croft of Keinula from Urjala; several sheds, log barns and a smoke sauna surround the croft of the Flink. The buildings here are presented exactly in the spirits of old times.